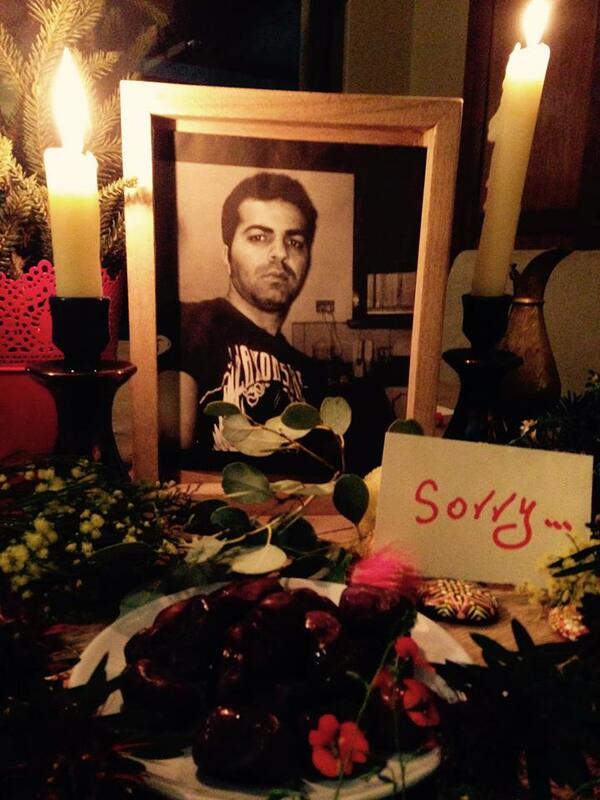 The very last picture to be taken of Hamed Shamshiripour is too distressing to publish. It looks like the scene of a lynching. 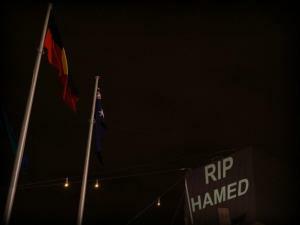 In many respects, it is. 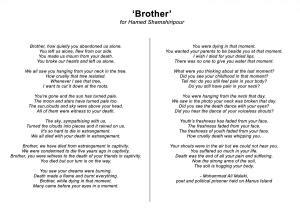 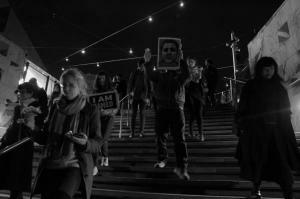 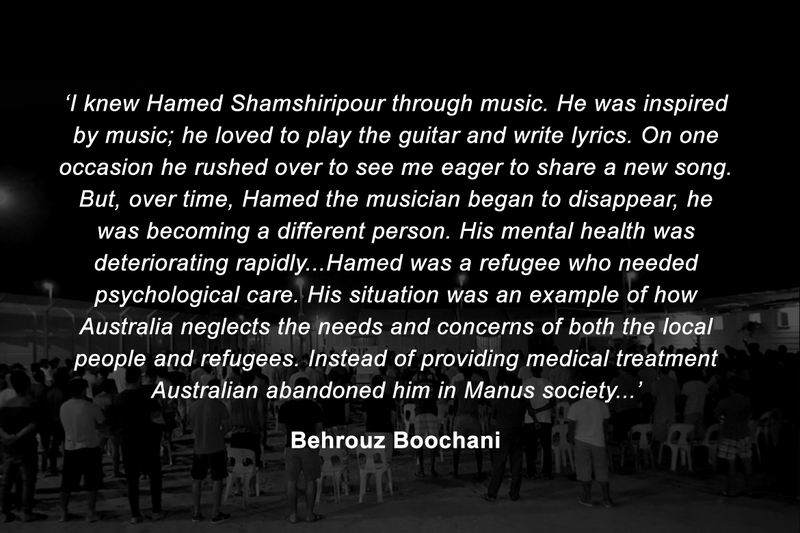 Hamed Shamshiripour was a 31 year old man from Iran who was sent by force to Manus Island after arriving in Australia by boat in August 2013. 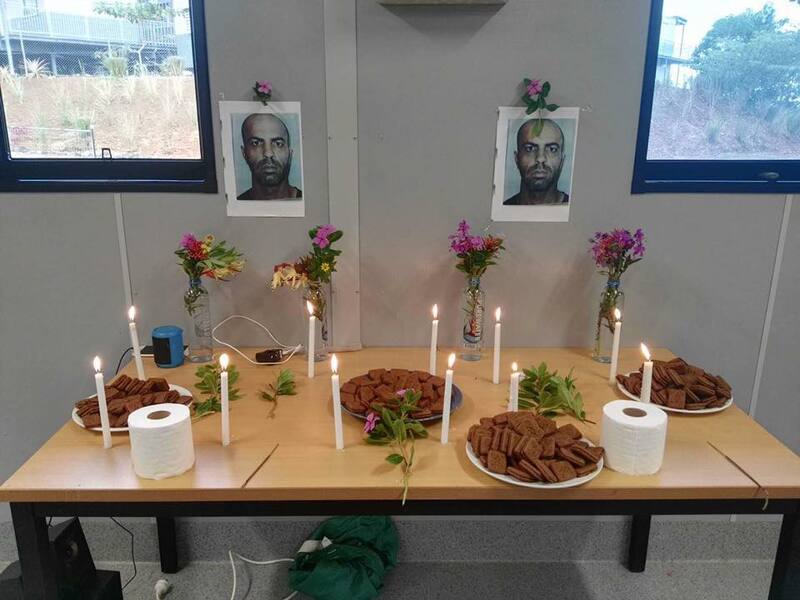 Four years later, on 7 August 2017, he was found dead in East Lorengau, Papua New Guinea. 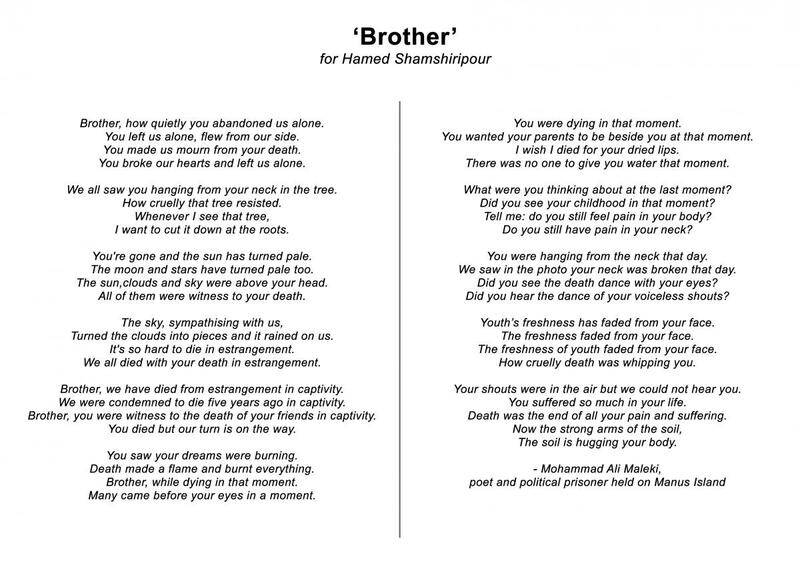 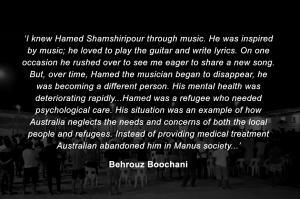 Hamed’s friends remember him as a kind and gentle man who was a talented guitarist and singer. 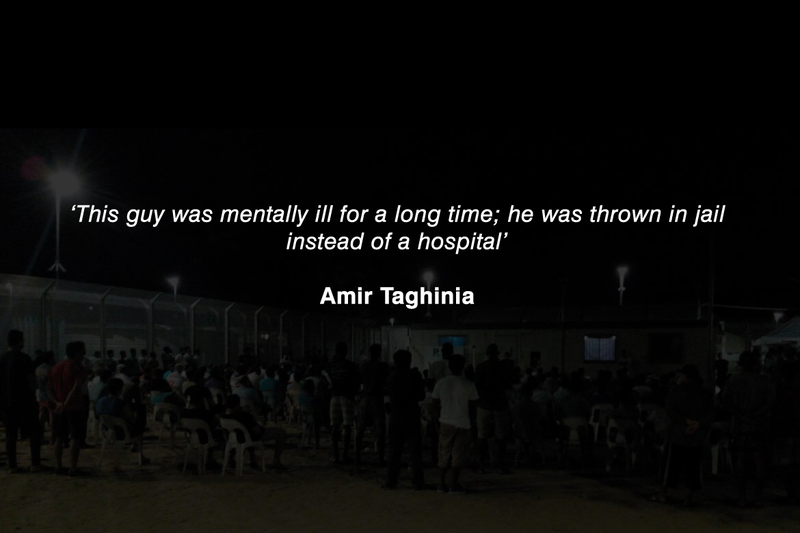 They recall the deterioration of his mental health over the period of his incarceration on the island and how he was abandoned by service providers. 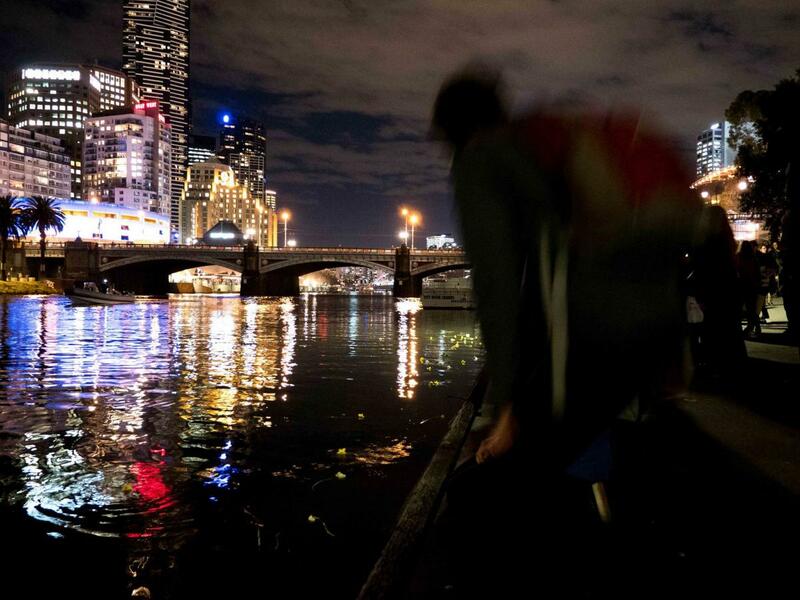 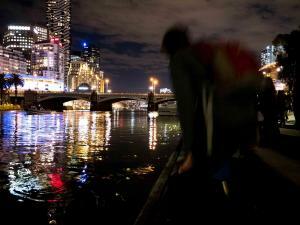 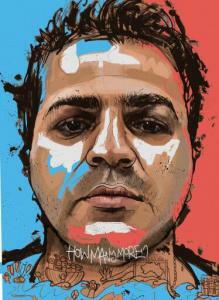 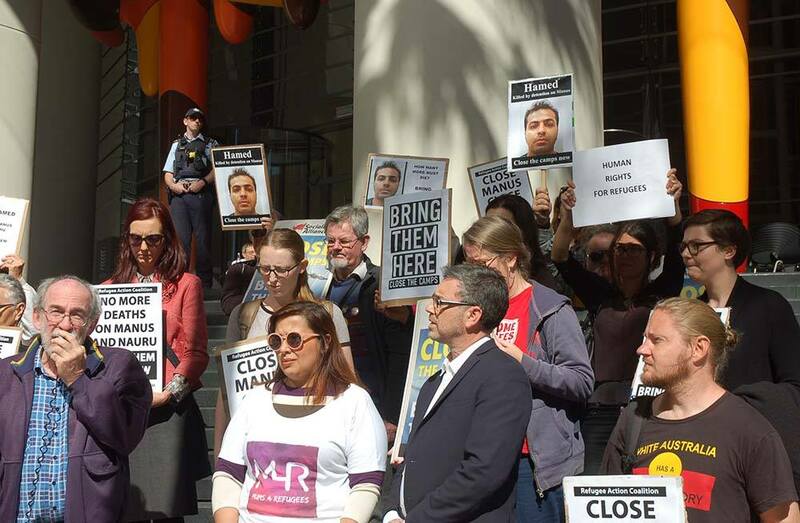 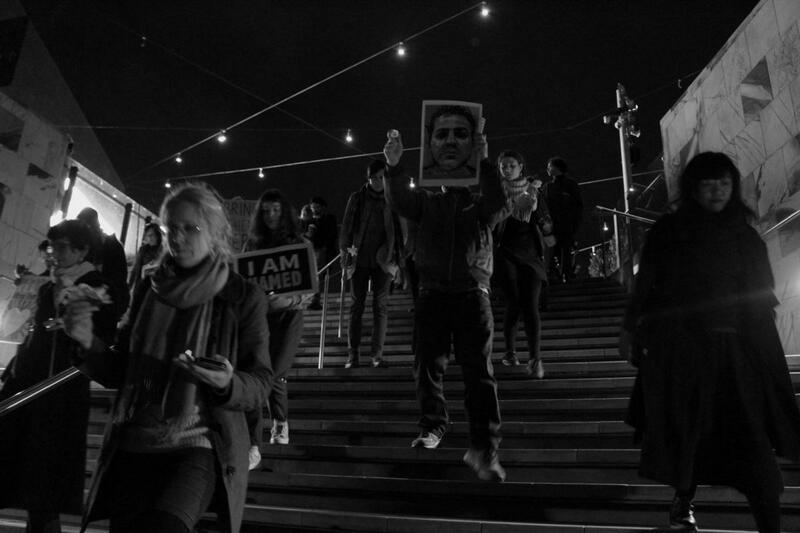 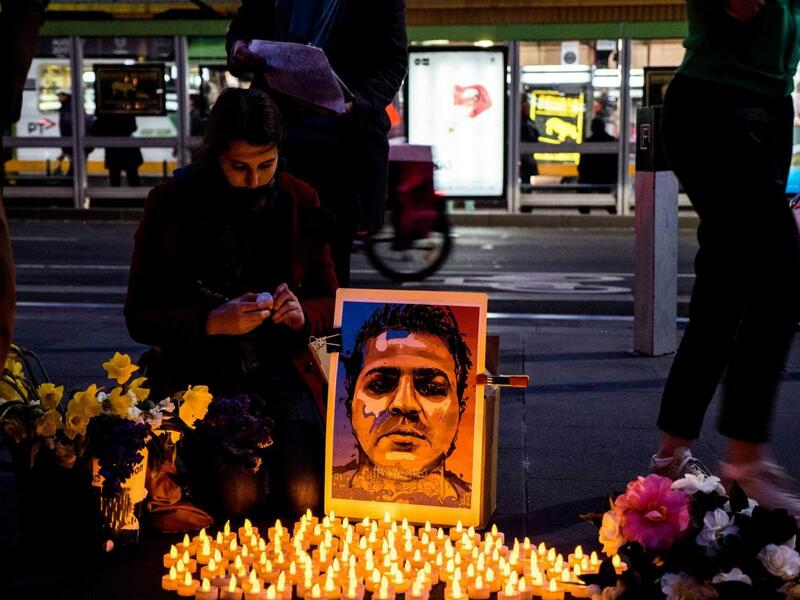 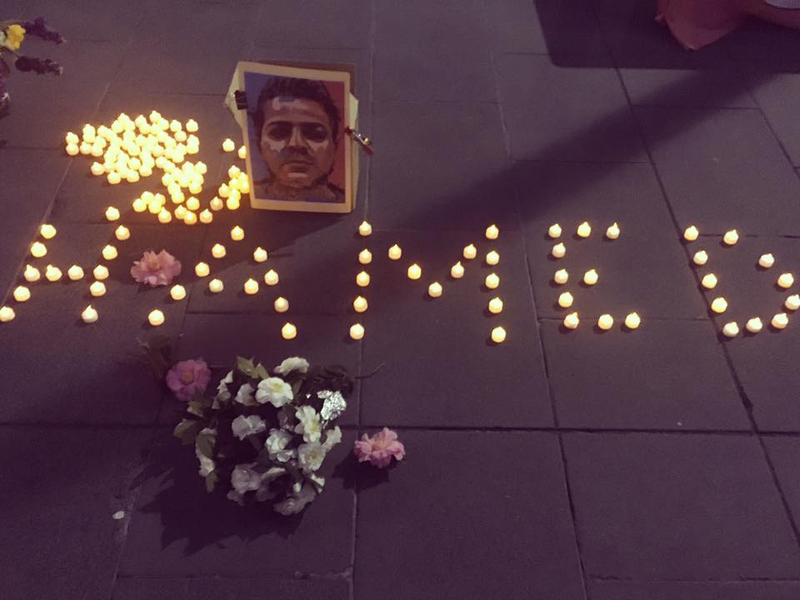 In 2015, Hamed was brought to Melbourne, Australia, for several months for medical treatment, but was subsequently returned to Manus Island despite ongoing concerns for his physical and mental health. 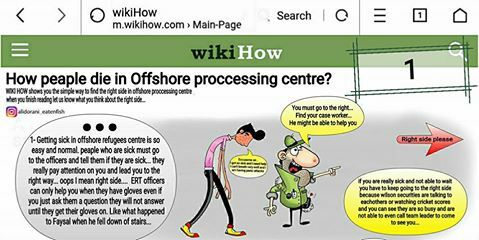 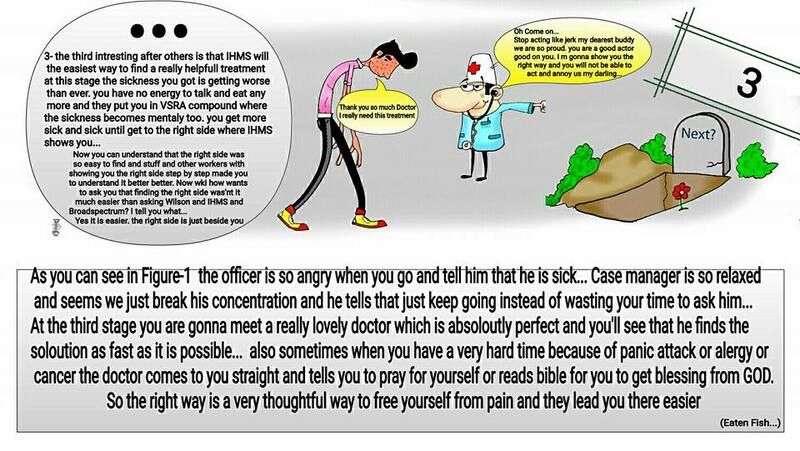 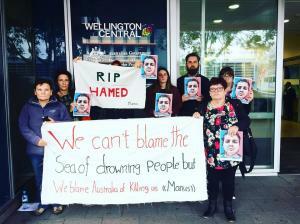 Countless pleas and appeals were made to the Immigration Department and IHMS to provide Hamed with support. Continual warnings of a fatal outcome were delivered by advocates and friends; however the Australian government failed to intervene. 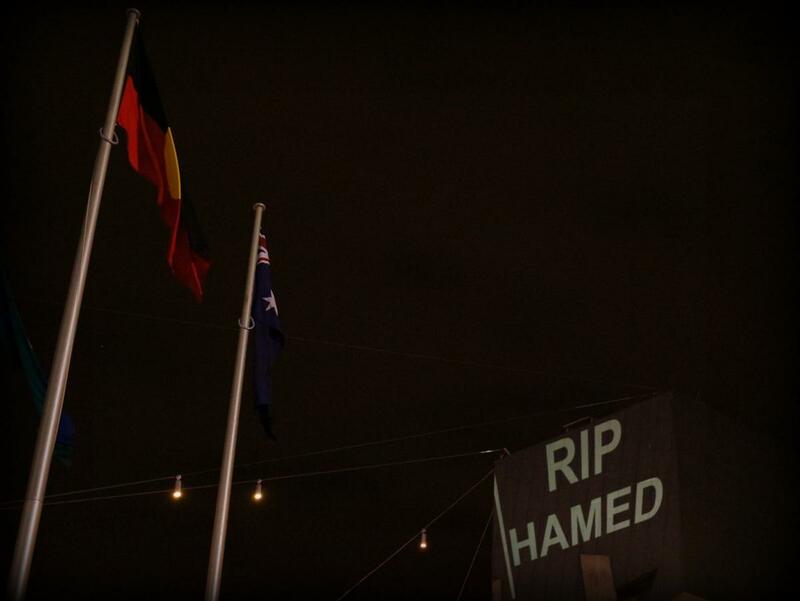 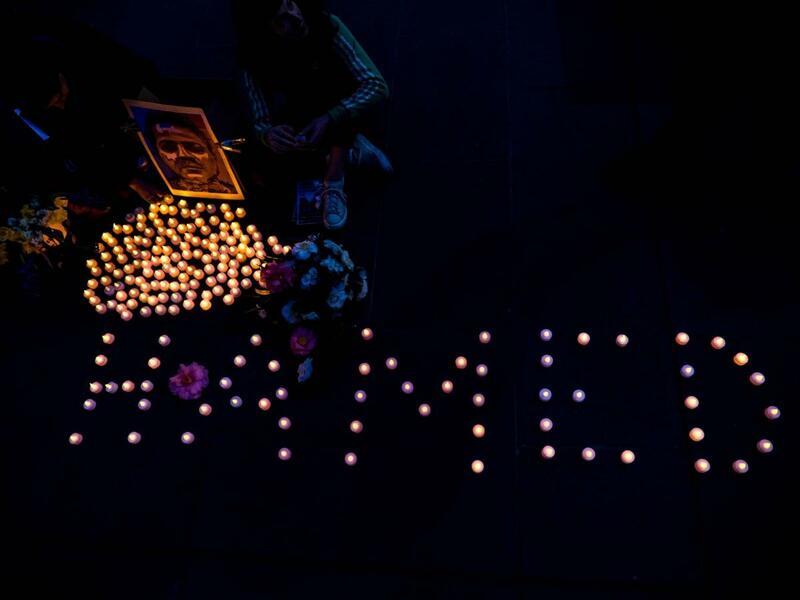 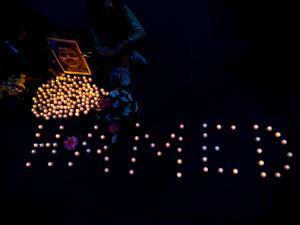 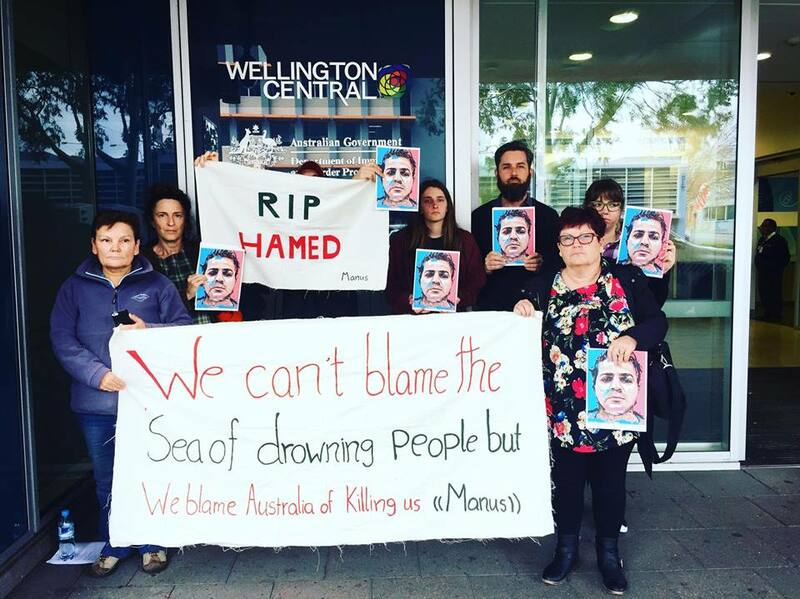 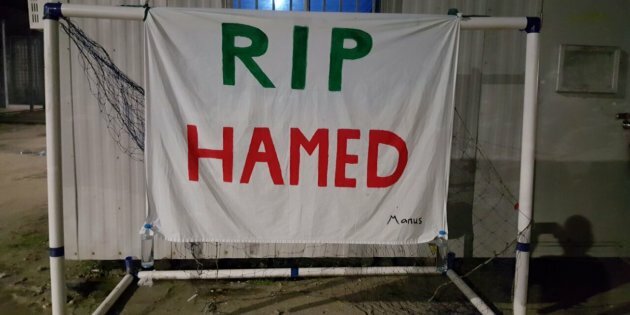 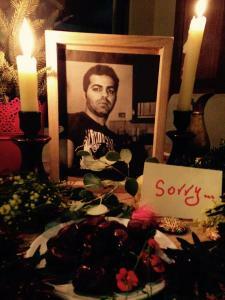 Hamed’s death by policy is the fifth death by unnatural causes, since 2014, of a person detained by the Australian government on Manus Island. 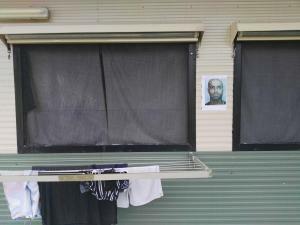 It is further evidence of a deadly, systemic neglect. 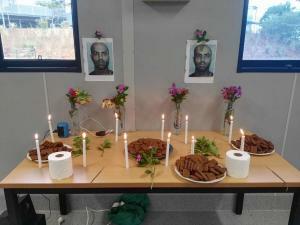 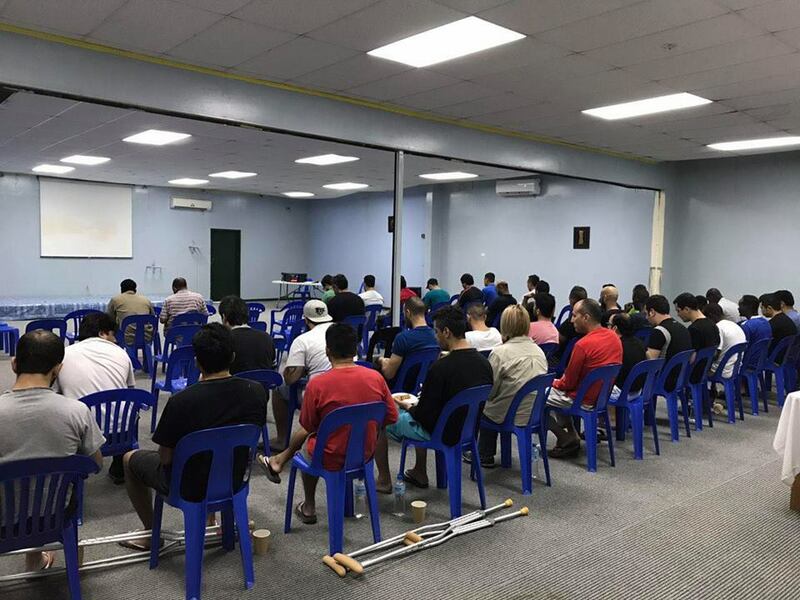 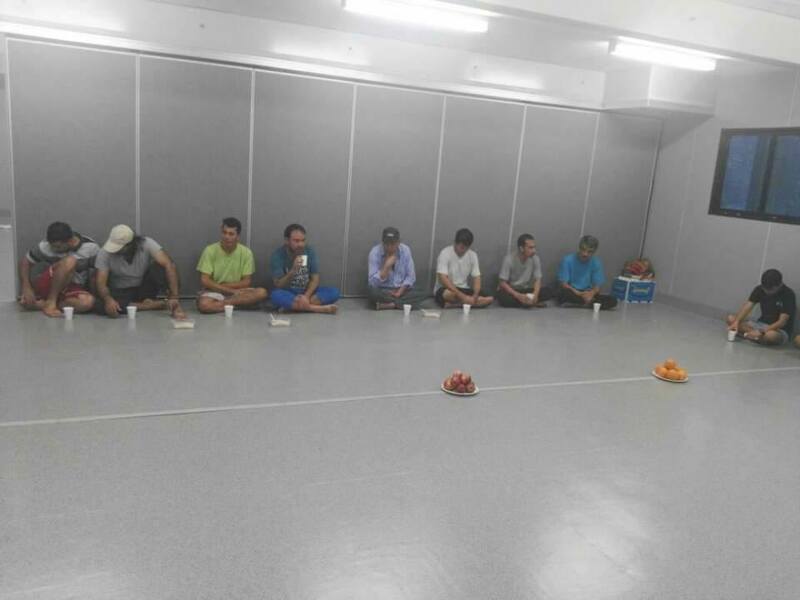 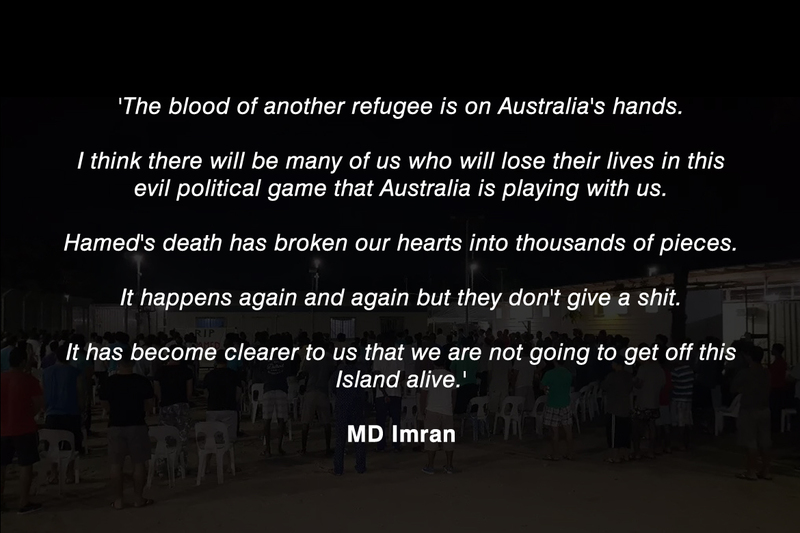 In the aftermath of his death, his friends and fellow prisoners held ceremonies of remembrance in Delta compound at the Manus Island RPC, at the Lorengau Transit Centre and in Port Moresby in PNG. 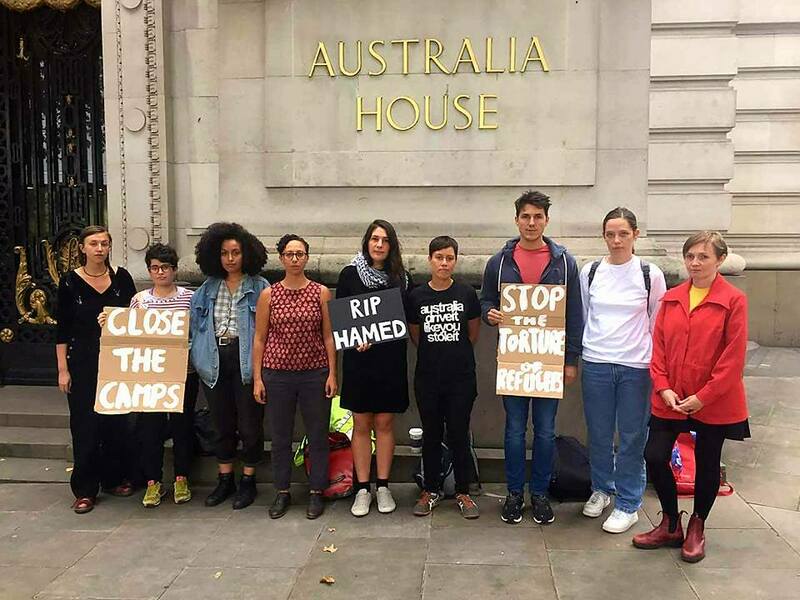 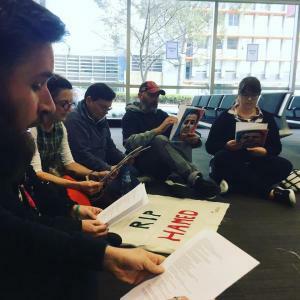 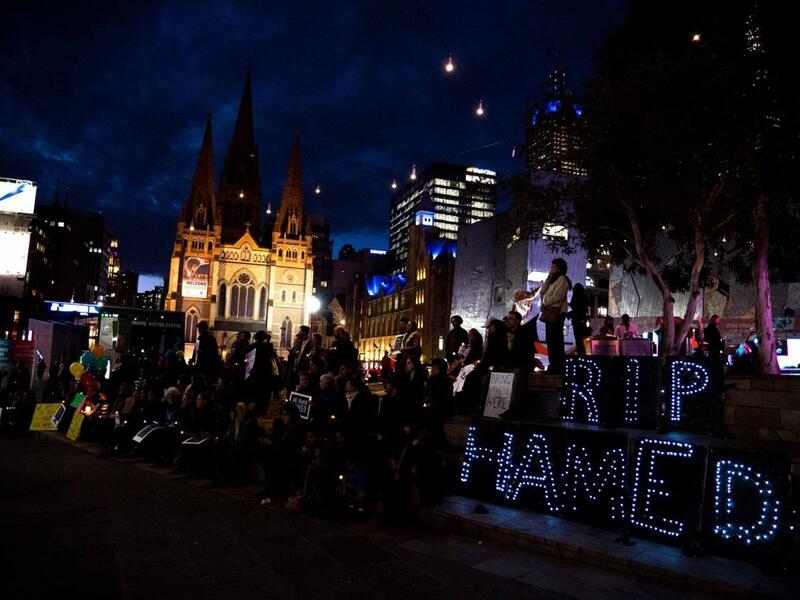 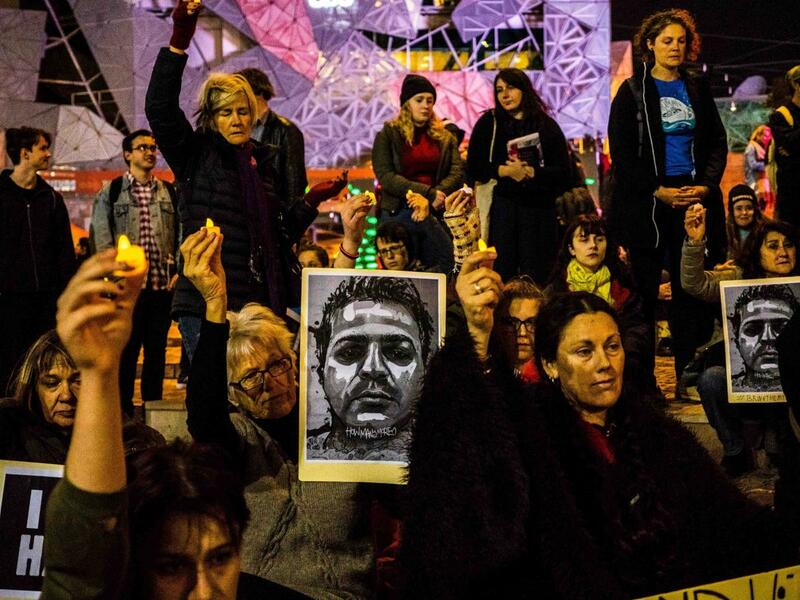 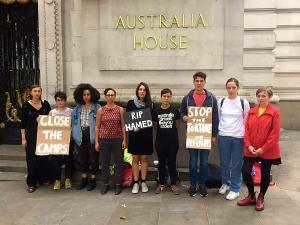 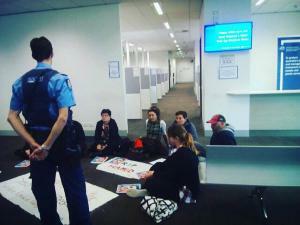 Actions of solidarity were held around Australia including in Brisbane, Canberra, Leura, Melbourne, Perth and Sydney as well as in New Zealand and London. 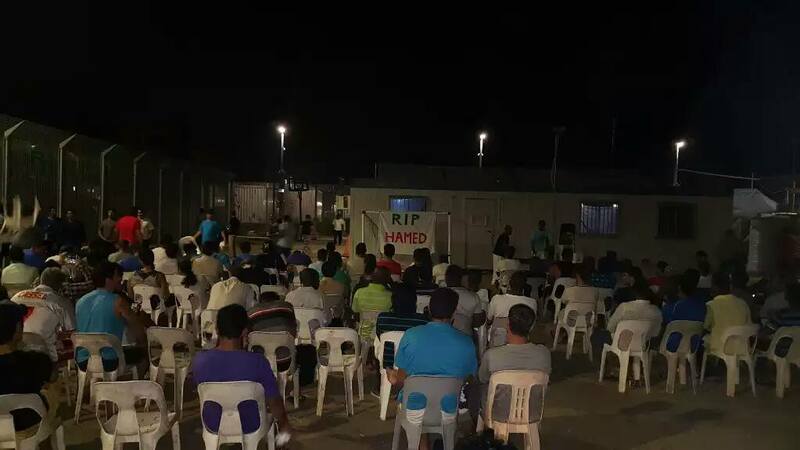 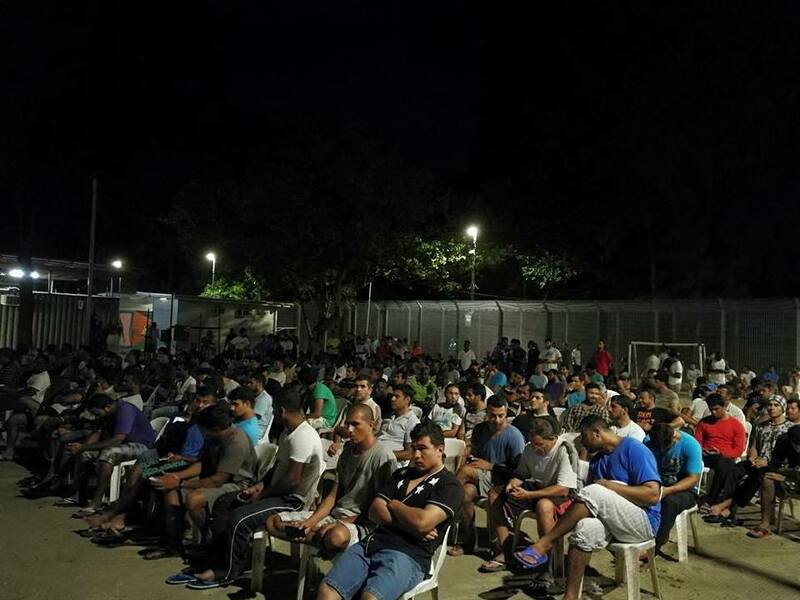 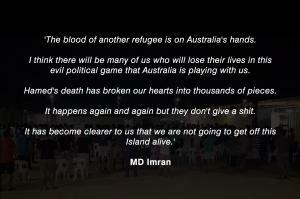 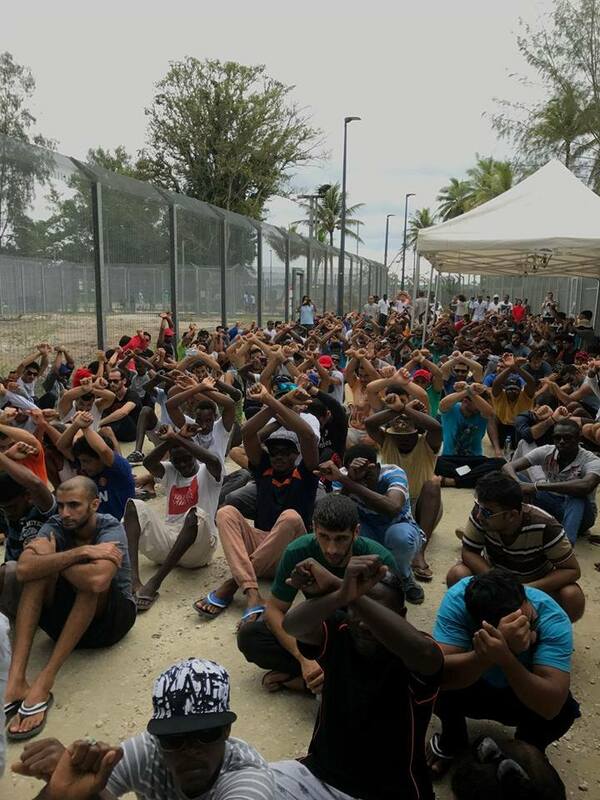 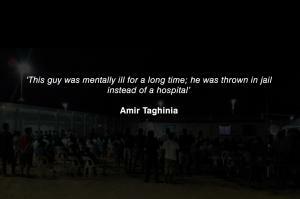 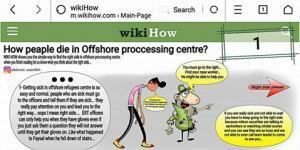 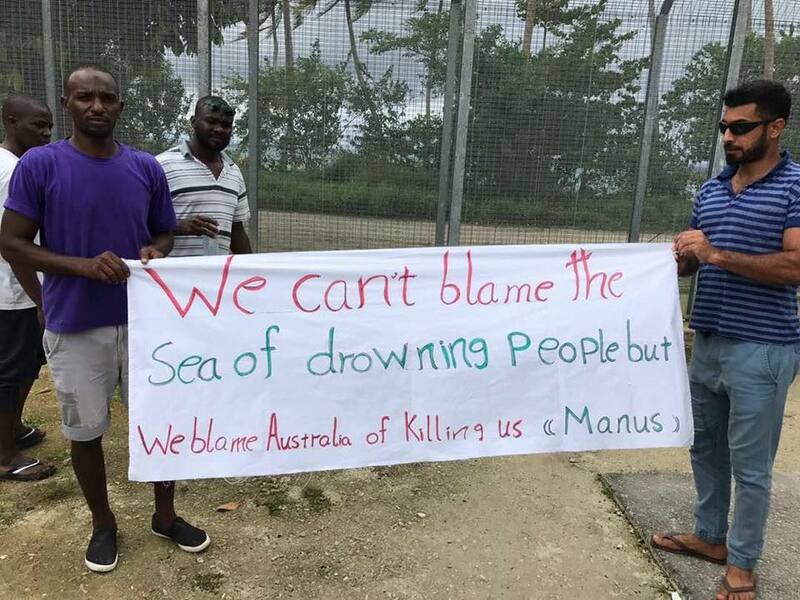 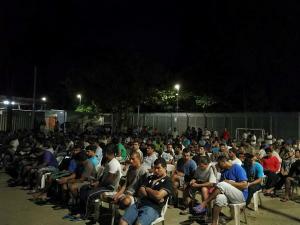 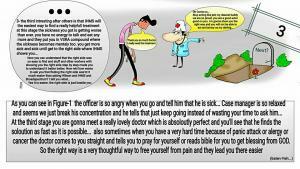 On 8 August peaceful protests resumed in the Manus prison and continued throughout the month.